Citation: Reyes D R&Romo M E. (2017) Ozone Therapy for Spine Diseases: Review of Cases. International Journal of Bioprocess and Biotechnological Advancements, 2(1): 88-92. Copyrights: :©2017Reyes D R &Romo M E. This is an open access article distributed under the terms of the Creative Commons Attribution License, which permits unrestricted use, distribution, and reproduction in any medium, provided the original author and source are credited. 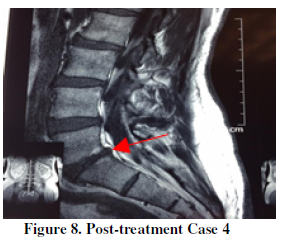 The objective of these clinical case studies is to demonstrate the therapeutic effectiveness of ozone therapy in cases of hernial discs and vertebral arthrosis in the lumbar sacral region. 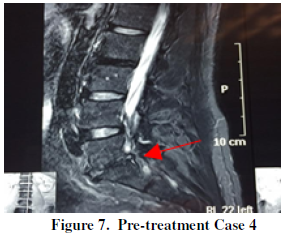 A total of 4 patients were chosen: Two diagnosed with lumbar disc herniation; and two with discartrosis in the lumbar sacral region, at Ozonocenter Medical Center in Quito-Ecuador, in the second half of 2016. Patients showed clear clinically signs of the disease: lumbar pain, gluteal pain, lumbar pain at walking and pain when sitting for too long. 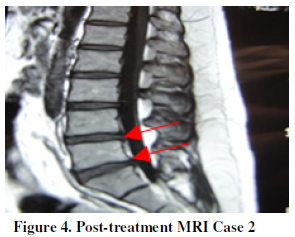 Nuclear magnetic resonance studies (MRI) of the lumbar sacral region were used to corroborate the presence, type and size of the illness before and after the treatment. All four patients, showed size reduction of the protrusions discs and discartrosis improvement. A monthly follow-up with these patients was done during six months; they all remained asymptomatic during this period. 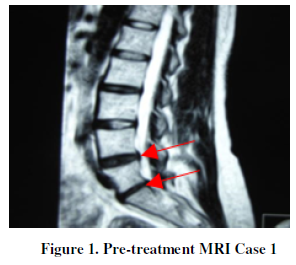 In conclusion, ozone therapy is an excellent medical procedure for the resolutions of disc protrusions and discartrosis at the lumbar sacral level. 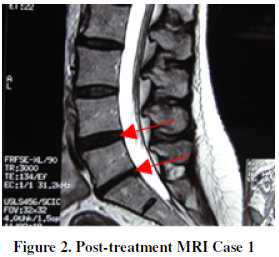 Keywords: Disc herniation, Lumbar sacral region, Discartrosis, Ozone therapy, Protrusions, Nuclear magnetic resonance (MRI). Ozone in column discopaties accelerates the degradation of polyglucosides in the nucleus pulposus of the intervertebral disk which leads to its reabsorption, with the consequent reduction of the herniated material responsible for nerve compression. Ozone also eliminates the chemical mediators of inflammation (Fospolipasa A2, Metalloproteinases, Prostaglandin E2, IL6, Glycoprotein YKL-40) that are released with the rupture of the nucleus pulposus of the injured disk and cause inflammation, muscle contracture, lack of irrigation (tissue hypoxia, ischemia, and acidosis), local edema, demyelination and nociceptive stimulus (pain). Ozone stimulates the action of the growth factor (TGF-B) favoring the regeneration of tissues. It increases the ability of the blood to absorb and transport oxygen (hyperoxygenation) improving micro circulation and cellular functions, decreasing edema, regulating the cellular Redox balance and neutralizing the free radicals of oxygen [1-5]. This study was reviewed and approved by the Ozone Center Ethics Committee; it complied with the Helsinki Declaration requirements, latest version - General Assembly of Edinburgh, Scotland, October 2000 . The following technique was used with all patients: After disinfecting the area, we did an infiltration of the compartment of the psoas or Bonitot space, with 15 cc of ozone at a concentration of20 ug/cc, 4 cm from the spinous process at intercrestas iliac or Tuffier line level which corresponds to L4, following the technique of Capdevilla or modified Nizora, defining the infiltration side based on the location of the lumbar problem or paresthesia in the lower limb in case of Radiculopathy. Very thin needles were used, No. 22 x 7 cm . locations depending on the position of the root disk conflict. Needles No. 23 x 3.8 cm were used. The longer needles and therefore deeper infiltrations are aimed at reaching the emergency of the radicular nerve root and the site of infiltration (right or left) depends on the place where is located the conflict root disk (pain, paresthesias in the buttock, leg, foot) corresponding. 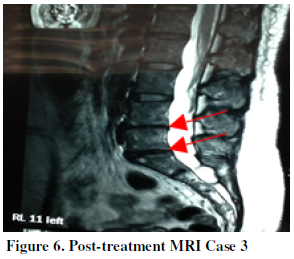 Studies of magnetic resonance imaging (MRI) of the lumbo sacral region were used to corroborate the evolution of the injuries at the end of the treatment. The characteristics of the pain and further details of the examination, was not evaluated for not being a reason for the study. In the past couple of years, Ozone therapy has developed as an effective therapeutic method, being recognized and used in various countries around the world. There are currently more than 40 national and international associations that bring together professionals who practice this therapy. One of the most recent achievements was to unify criteria in terms of methods and procedures to follow in the "Madrid’s Declaration of Ozonetherapy ", signed in Madrid, Spain (June 2015) during the international meeting of Ozone therapy schools. It is currently the only existing global document on ozone and its recommendations are implemented around the world . Ozone treatments are considered modern therapies of great utility in multiple pathologies; they have great results in herniated discs at the lumbar area. This technique is based on the infiltration of ozone in the paravertebral muscles adjacent to the injury and/or the emergence of the nerve roots that form the spinal/sciatic nerve. Psoas or Bonitot space chamber infiltrations along with Capdevilla or modified Nizoratechnique, help block and reduce the pain, symptoms and size of the herniated material by ceasing the compressive effect [9-11]. A recent meta-analysis showed that ozone therapy is as effective as surgery, with much less adverse events and also less expensive. It is currently one of the best options to treat Herniated disc pain, with the advantage of being an outpatient treatment. The benefits are long-lasting and there aren’t adverse results if the technique is well used . There are discolysis techniques with ozone, which must be carried out in an operating room with the support of sedation and fluoroscopy equipment to guide needles puncture. These techniques are more expensive and their benefits do not exceed the ones of paravertebral ozone infiltration [13-16]. On a Meta-analysis done by Steppan J. on 2010, he studied the use of ozone in Herniated discs cases and concluded that the technique of intradiscal ozone therapy or intraforaminalhas an II-3 level of evidence; while the technique of paravertebral ozone has an II-1 level of evidence . 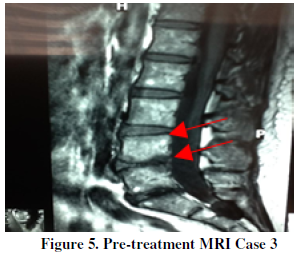 The analysis carried out at Ozone Medical Center confirms the results observed by other authors, ozone reduces the size of the discal protrusions and discartrosic vertebral lesions, as well as the symptomatology. In conclusion, the paravertebral ozonetherapy, constitutes an excellent medical procedure for Herniated discs and spinal discarthrosic; providing patients a better quality of life. Further studies on this matter are needed to establish treatment protocols. Bocci V (2005) Ozone a new medical drug. J Chem Information Modeling. Holanda 53: 1699. Bocci VA (2006) Scientific and medical aspects of ozone therapy. State of the art. RivItal di Ossigeno-Ozonoterapia5: 93-104. Schwartz A, Martínez-Sánchez G, Scwhartz A (2012) La ozonoterapia y su fundamentación científica. Rev Española Ozonoterapia [Internet] 2: 163-198. Travagli V, Zanardi I, Bocci V (2006) A realistic evaluation of the action of ozone on whole human blood. Int J BiolMacromol 39: 317-320. Valdenassi L, Franzini M, Simonetti V, Ricevuti G (2016) Oxygen-ozone therapy: paradoxical stimulation of ozone. Ozone Ther 1: 2. Helsinki D (2000) Principios éticos para las investigaciones médicas en seres humanos. Asociación Médica Mund. Mejía G, Panoso A GA (2010) Bloqueo del compartimiento del psoas. RevMexAnestesiol 33: 31-38. ICSCO3 (2015) Declaración de Madrid sobre la ozonoterapia 2015. (2ndedn), Madrid, España, GrafoxImprenta, SL. Viebahn R (2007) El uso del ozono en medicina. Cuarta edi. Munich, Alemania. Stockburger D, Del H (2008) Uso del Ozono en Medicina, Usos PY. Terapia con ozono. Ateramex, Alicante, España. Paoloni M, Sante L Di, Cacchio A, Apuzzo D, Marotta S, Razzano M, et al. 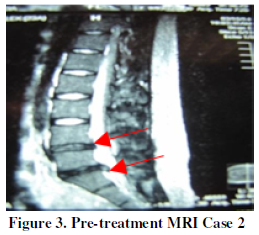 (2009) Intramuscular Oxygen-Ozone Therapy in the Treatment of Acute Back Pain With Lumbar Disc Herniation. Spine 34: 1337-1344. Magalhaes FNDO, Dotta L, Sasse A, Teixera MJ, Fonoff ET (2012) Ozone therapy as a treatment for low back pain secondary to herniated disc: a systematic review and meta-analysis of randomized controlled trials. Pain Physician 15: 115-129. Bonetti M, Fontana A, Cotticelli B, Dalla Volta G, Guindani M, et al. (2005) Intraforaminal O2-O3 versus periradicular steroidal infiltrations in lower back pain: Randomized controlled study. Am J Neuroradiol 26: 996-1000. Jiménez S, Toro M, Baiz C, Soc R, Dolor E (2014) Eficacia de la infiltración de ozono paravertebral lumbar y en puntos gatillos como coadyuvante del tratamiento en pacientes con dolor lumbar crónico y lumbociatalgia crónica en el síndrome doloroso miofascial aislado o acompañado de otras patologías. RevSoc Española del Dolor 21: 23-38. Canovas L, Alonso M, Couñago S, Rojas (2015) JOAH Alivio Del Dolor Discogénico : Experiencia En 51 Casos. Rev Soc Española del Dolor 22: 27-31. Rosato ML, Mainini M, Luongo M, Mascolo L, Mattera S, Schiaffino L (2016) Oxygen-ozone therapy : our experience in the treatment of hard-root conflicts. Ozone Therapy 1:1-2. Steppan J, Meaders T, Muto M, Murphy KJ (2010) A Meta analysis of the Effectiveness and Safety of Ozone Treatments for Herniated Lumbar Discs. J VascIntervRadiol.